This Thai Chicken Satay kabob is juicy and full of flavor when marinated, grilled and served with a tangy red pepper sauce. Love kabob? 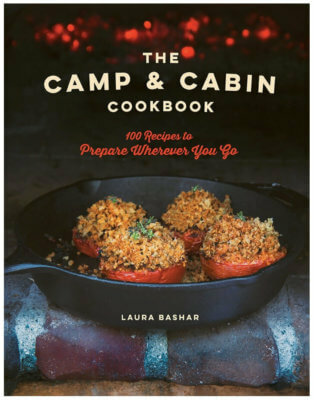 Try my Persian kabob recipes. I’ve joined another group of cooking bloggers! Am I nuts? This one is The Daring Kitchen. I should have known I was getting myself into the thick of things, just by the title’s name! But I want to branch out and try new recipes and cooking techniques. It’s time to get out of my comfort zone! 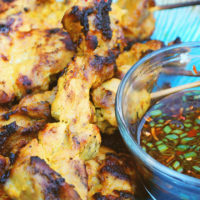 The January 2010 DC challenge was hosted by Cuppy of Cuppylicious and she chose a Thai-inspired recipe for Pork Satay from the book 1000 Recipes by Martha Day. I admit to not being a fan of Thai food, so will this recipe change my mind? Who knew that countries from all over the world make kabob?! 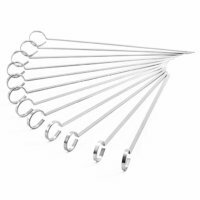 Being half Iranian, I grew up with Persian kabob so I was already a lover of skewering and grilling meat. I was happy to learn that satay was the Thai version of kabob. Satay is from Indonesia and includes cut up slices of chicken, lamb, beef, pork, fish and tofu that is marinated. 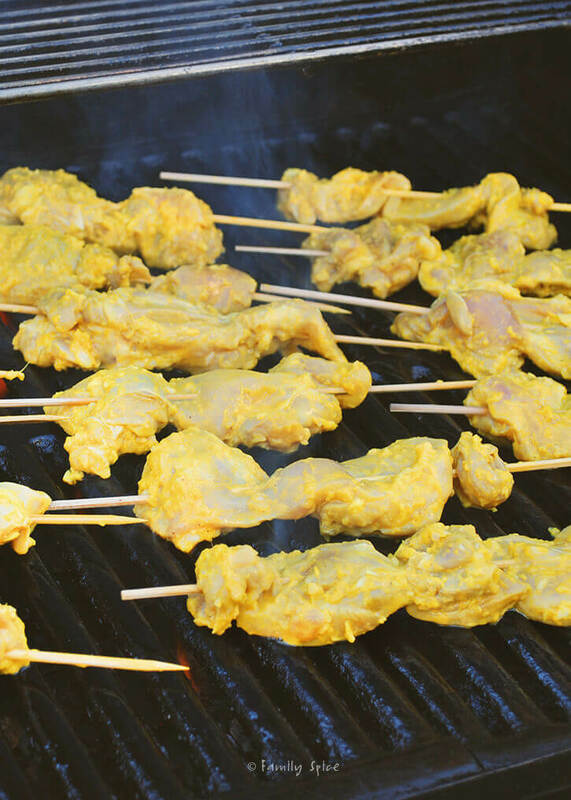 What is in the marinade varies on what region the satay originates from. Despite all of the varieties, it is a very popular street food for the region. 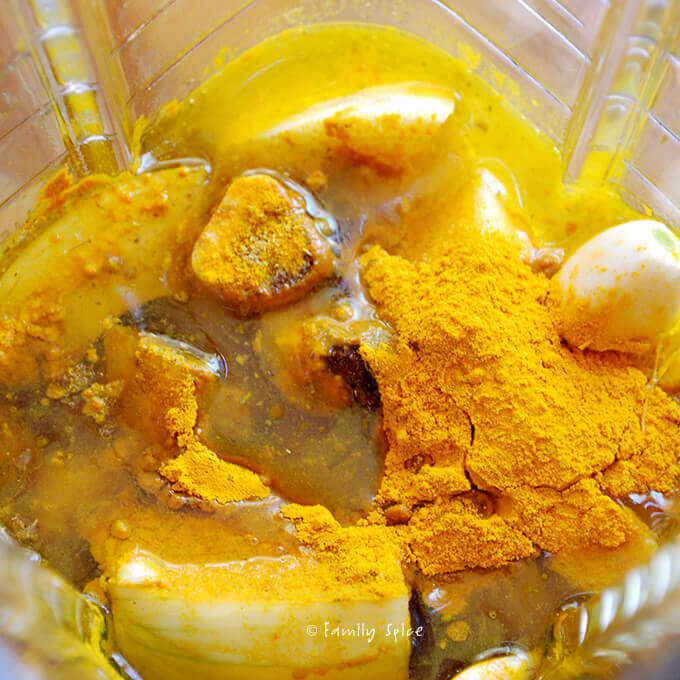 The marinade we are using for this challenge is filled with flavors that I am very familiar with: onions, garlic, ginger and turmeric to name a few. Once I saw that I was not going to burn the roof of my mouth with hot chiles, I was committed to making the best chicken satay ever. I put all of the marinade ingredients in my blender and whipped it up to a smooth frenzy. Once the chicken breast was chopped up, I combined everything in a resealable bag and let the chicken sit in the marinade for 2 to 12 hours. My chicken was marinating for 4 hours and it was delicious! 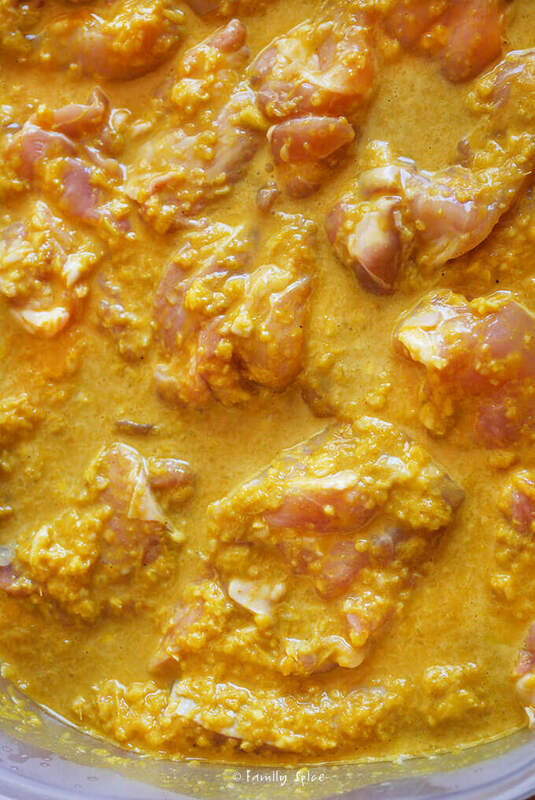 The marinade not only intensifies the flavor of your chicken, but it also tenderizes the meat. Onions, lemon juice and olive oil makes you chicken moist and tender while the remaining ingredients provide flavor. We used chicken thighs for this recipe and kept them into long strips, about 1-inch wide. This is different from Persian chicken kabob (joojeh kabob) where we cut the chicken breast into cubes. 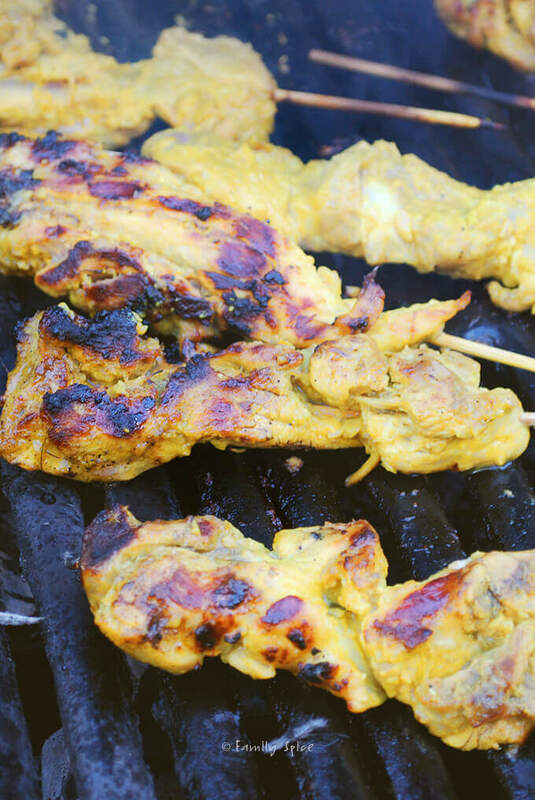 Once marinated and skewered, the chicken satay were grilled and ready after 20 minutes. I always think Thai food being about peanut butter on chicken with hot peppers. Well, I wasn’t too far off the mark. Satay is served with any number of dipping sauces, including a spicy peanut sauce – Aha! I was right! But, I am happy to report, that there are a number of other sauces you can choose from, as well. I adapted the red pepper sauce to my personal taste. And of course you can totally serve your chicken satay with traditional peanut sauce. You can wrap the chicken satay in bread to make sandwiches. I served the satay with Basmati rice, the rice of choice for my family. You can also use short grain rice. I also had some leftover roasted vegetables from the night before that tasted great when mixed with my dipping sauce. 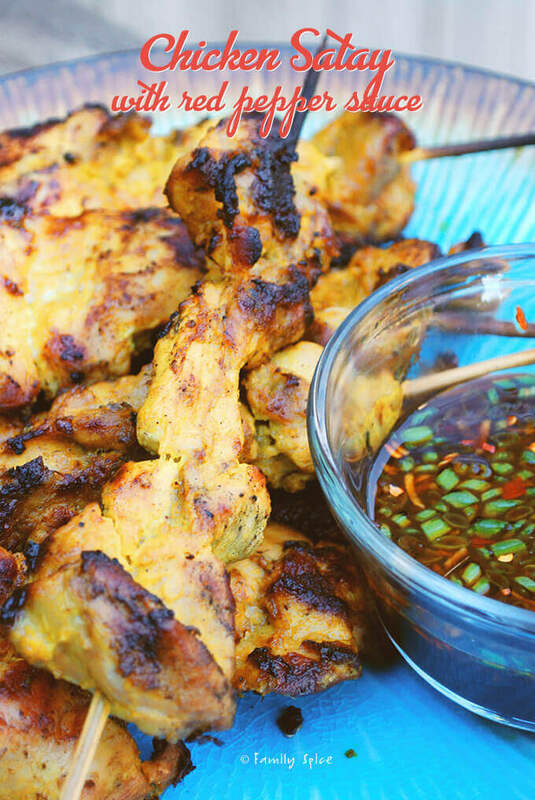 For a lighter meal, feel free to serve this chicken satay with a green salad or slaw. Overall, I was super pleased with my first attempt at Thai cooking. It definitely opened my eyes and making me a big satay fan. I hope you enjoy this recipe as well! This Thai Chicken Satay kabob is juicy and full of flavor when marinated, grilled and served with a tangy red pepper sauce. Cut chicken thighs into 1 inch strips and place in a large resealable bag. 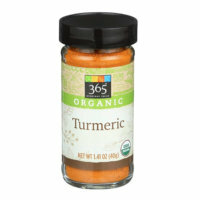 In a blender add onions, garlic, 1 TBS grated ginger root, 2 TBS lemon juice, 1 TBS soy sauce, coriander, cumin, turmeric and olive oil and blend until smooth. Pour marinade over chicken, seal bag and squeeze until chicken is completely coated in marinade. Chill in the refrigerator to marinate 2-12 hours. 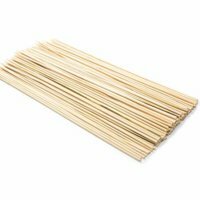 If using wooden or bamboo skewers, soak your skewers in warm water for at least 20 minutes before preparing skewers. Gently slide meat strips onto skewers. Broil or grill at 290°C/550° F (or pan fry on medium-high) for 8-10 minutes or until the edges just start to char. Flip and cook another 8-10 minutes. For the red pepper dipping sauce, whisk together in a small bowl 1/4 cup soy sauce, 1 TBS lemon juice, brown sugar, 1/2 tsp grated ginger, red pepper flakes and green onions. 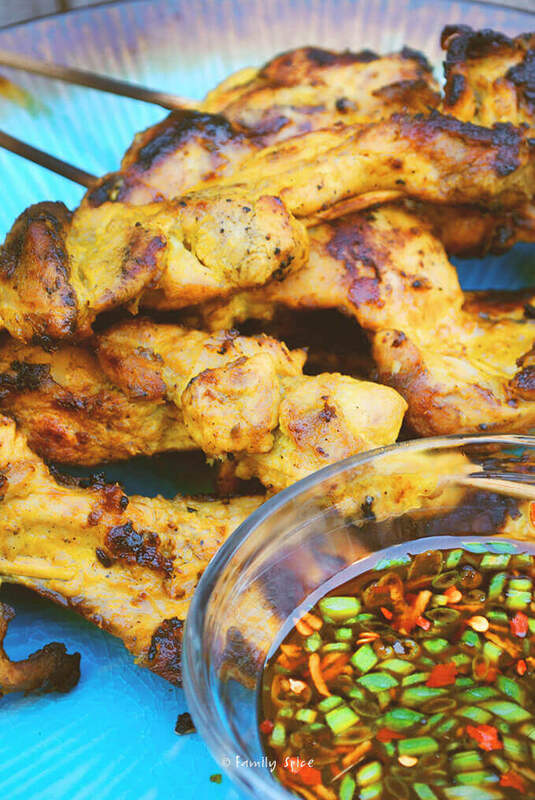 Serve grilled chicken satay with red pepper sauce.